The One Hundred Fourth United States Congress was a meeting of the legislative branch of the United States federal government, composed of the United States Senate and the United States House of Representatives. It met in Washington, D.C. from January 3, 1995, to January 3, 1997, during the third and fourth years of Bill Clinton's presidency. Apportionment of seats in the House of Representatives was based on the 1990 United States census. Both chambers had Republican majorities for the first time since the 1950s. 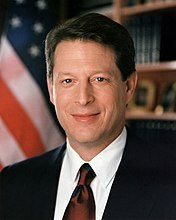 Major events included passage of elements of the Contract with America and a budget impasse between Congress and the Clinton Administration that resulted in the Federal government shutdown of 1995 and 1996. January 3, 1995: Republicans gained control of both houses for the first time since 1954. January 31, 1995: President Clinton invoked emergency powers to extend a $20 billion loan to help Mexico avert financial collapse. November 5, 1996: Re-election of President Bill Clinton; Democrats gained 8 seats in House; Republicans gained 2 seats in Senate. Senators' party membership by state. In this Congress, Class 2 meant their term ended with this Congress, requiring re-election in 1996; Class 3 meant their term began in the last Congress, requiring re-election in 1998; and Class 1 meant their term began in this Congress, requiring re-election in 2000. ^ "Historian Newt Gingrich Responsible For Decade Long Lack Of Official House Historian". wordpress.com. January 25, 2012. Retrieved April 6, 2018. 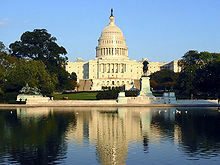 "Videos of House of Representatives Sessions for the 104th Congress from www.C-SPAN.org". "Videos of Senate Sessions for the 104th Congress from www.C-SPAN.org". "Videos of Committees from the House and Senate for the 104th Congress from www.C-SPAN.org". House of Representatives Session Calendar for the 104th Congress (PDF). Congressional Pictorial Directory for the 104th Congress. Official Congressional Directory for the 104th Congress.